There is a common misconception that market research initiatives are reserved only for market research departments or product development teams. 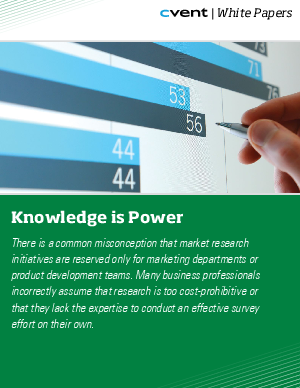 Many business professionals incorrectly assume research is too cost-prohibitive or that they lack the expertise to conduct an effective survey effort on their own. In actuality, there are many ways to gather feedback and information to make your business or organization more successful. Perhaps the easiest, yet most powerful way, is using online surveys. Online surveys are easy to design and implement with minimal resources. When you utilize a full featured online survey application or feedback management solution, you can conduct exhaustive research efforts without the expense and hassle of a third party. Using online surveys to gather business intelligence is a proven and cost efficient way to help your organization thrive.